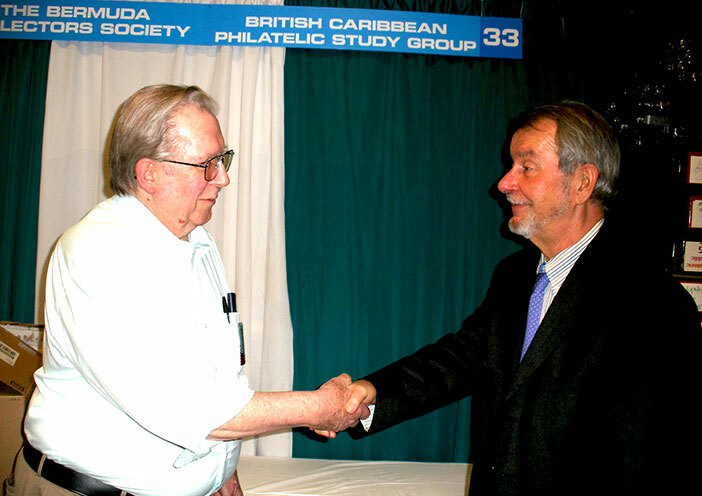 DENVER, Colorado: British Caribbean Philatelic Study Group president, Mr. Duane Larson congratulates BVI Philatelic Society president, Dr. Giorgio Migliavacca (at right) as recipient of the 2015 Addiss Award for lifetime achievement in philatelic writing and research. British Virgin Islands Philatelic Society president, Dr. Giorgio Migliavacca has successfully participated in the activities of the Rocky Mountain Philatelic Exhibition, ROMPEX, held in Denver, Colorado on 15-17 May 2015, an American Philatelic Society “World Series of Philately” Stamp Show. Dr. Migliavacca presented his paper on “The Diaspora of Italian Prisoners Of War captured in Africa: 1940-1946” at the 14 May well attended pre-show Seminar on African Philately and Postal History; 13 panelists and 60 attendees came from the United Kingdom, Bermuda, Europe, Canada and USA. Dr. Migliavacca’s collection on the POWs Diaspora won a gold medal at the show as well as the Military Postal History Society Special Award for the “Best Military Postal History Exhibit” as determined by the Rompex 2015 jury. Among the societies participating in the event was the British Caribbean Philatelic Study Group with a large contingent of mesmerizing exhibits; the grand award, in fact, went to the splendid collection of Richard Maisel featuring British Guyana stamps of the 1800s. The British Caribbean Philatelic Study Group held their Annual General Meeting at Rompex; part of the proceedings included the presentation of prestigious annual awards. Dr. Migliavacca was the recipient of the Addiss Award for lifetime achievement in philatelic writing and research. At the invitation of the past president of the Rocky Mountain Philatelic Library, Mr. Sergio Lugo, Dr. Migliavacca was given a guided and highly informative tour of the library where he was welcomed by Chief Librarian Ellengail Beuthel and her staff.